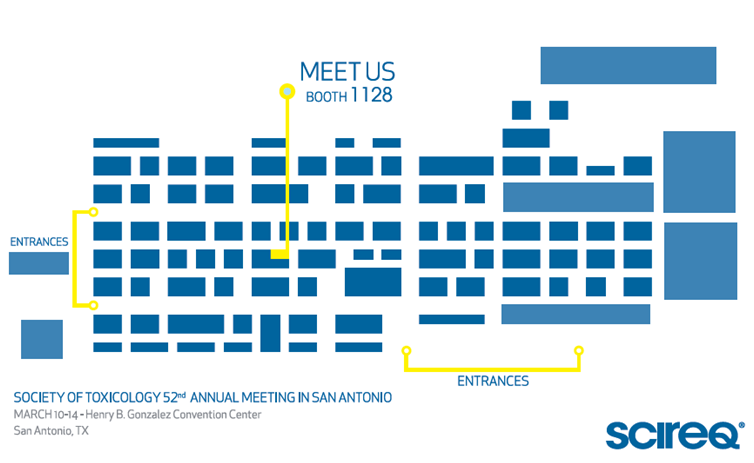 If your plans include attending the Society of Toxicology’s 52nd Annual Meeting, we invite you to visit us at booth 1128! 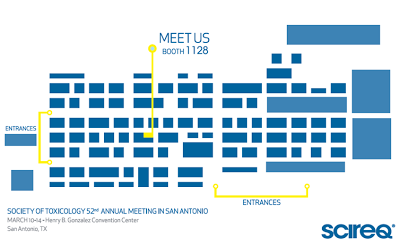 While in San Antonio, discuss your studies with our team, discover how our latest developments can impact your research and experience our systems for pre-clinical inhalation exposure and lung function measurements. REFINING THE DOSE RESPONSE: STANDARDIZING THE CHALLENGE. It is now easier than ever to compare inhaled challenges across studies thanks to new features available in our software. Nebulizer output may change over time and certainly varies from one substance to another. To address the variability, we have suggested characterizing the nebulizer before and perhaps throughout experiments. The latest version of our software includes a characterization procedure that embeds the nebulizer output within the experiment data file. In addition, it uses the results of the characterization to calculate delivered dose following an inhaled challenge. The combination of these new features allows for further refinement in how the data are reported and interpreted and provides a level of standardization that was previously unavailable. Following the preview available last fall at the SPS conference in Phoenix, view and discuss results from our collaboration with Dr. Simon Authier of CiToxLAB that aimed to test a novel approach (high frequency airwave oscillometry) to measure airway resistance non-invasively in conscious dogs and non-human primates while recording conventional breathing parameters (e.g. tidal volume, respiratory rate). Results are promising for applications in large animal toxicology studies as airwave oscillometry was well tolerated and more sensitive than some conventional respiratory parameters to drug-induced bronchoconstriction in non-human primates. Learn more at the poster presentation on Monday, March 11th from 1:00 pm - 4:30 pm. When it comes to inhalation exposure, SCIREQ offers the inExpose: a precise, bench top inhalation exposure system with customizable turn-key solutions from toxin generation to exhaust disposal, with real-time monitoring and control features, as well as computerized data acquisition and analysis. Its modular, compact form factor reduces direct and indirect costs, minimizes unintentional dilution and is ideal for use in a standard laboratory, without the need for a purpose-built facility. Interested in respiratory mechanics? Come see our flexiVent with its Multi-Subject Extension (MSX). The flexiVent system has long been considered the gold standard for pre-clinical respiratory mechanics assessments. When used in combination with the MSX, it offers distinct study design advantages and greatly increases the efficiency of experimentation. The system will allow you to accelerate data collection and expediently carry out time-sensitive studies. Visit our booth to discuss aerosol challenges or lung function measurements in conscious subjects, or for a demonstration of the inExpose or flexiVent. We look forward to speaking with you in San Antonio!